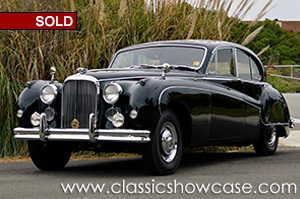 This very original, matching numbers 1959 Jaguar Mark IX has been well maintained and lovingly cared for by Jaguar professionals throughout its long term ownership. This Mark IX has been through a complete no expense spared restoration to the original condition by Jaguar professionals. Comes complete with tools, original radio and all working gauges. The transmission and engine have been rebuilt. The wood and leather have been restored as well as all the chrome. 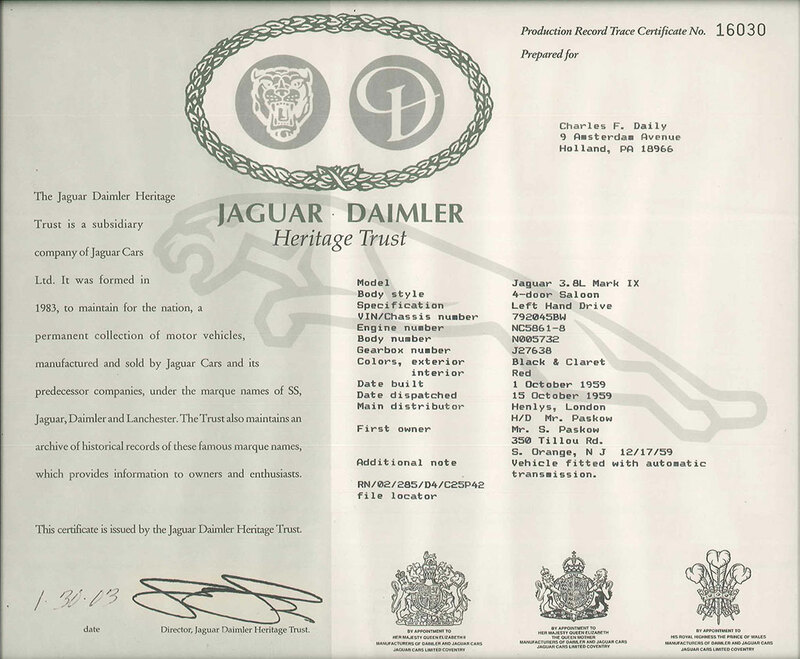 It features a Radiomobile AM radio, and includes its owner's manual, tools, jack, receipts from work completed, some photos of the restoration, original brochures, and its certification from Jaguar Daimler Heritage Trust . With beautiful lines and an elegant color combination, it is surely a head turner. More than just good looking, it is running and driving in very good condition, and has been driven regularly to keep everything in proper order. This is a collectible car that is appreciating in value and would be a nice addition to anyone’s Jaguar collection. With its great history of being campaigned, it was appreciated by judges and spectators alike as seen by the awards below. The Jaguar Mark IX is a large luxury saloon car produced by Jaguar Cars between 1959 and 1961. It replaced the previous Mark VIII, and differed little in exterior appearance except for the new model name. Standard transmission was a four-speed manual system: options included overdrive, but most cars were built with a Borg Warner three-speed automatic box. Internally, an enlarged-bore 3.8 L, 220 bhp DOHC straight-6 replaced the previous 3.4 L 190 bhp unit. Two SU carburetors were fitted. Four-wheel servo assisted Dunlop disc brakes and recirculating ball power steering was now standard equipment. The torsion bar independent front suspension and leaf-sprung rear live axle were retained from the Mk VIII. The body was generally similar to its predecessor, but the sunshine roof became a standard fitting for the UK market. The interior was in the same luxurious mode with extensive use of leather, walnut wood trim and deep pile carpet. A range of single and duo-tone paint schemes was offered.